This has been a long post in the making! I'm sorry for my absence. I was super sick for weeks with a nasty bug. I'm just getting over it. I wanted to share with you the ecocolumn project that we have been working on in our science class for a while now. It took FOREVER to collect 2 liter soda bottles from the kiddos. We needed three bottles per group. I teach 70 kids science each day, so I just did groups of 4 or 5. When I finally gathered enough bottles we cleaned and cut them. Then it was time to assemble the column and start to plant in the terrarium part. 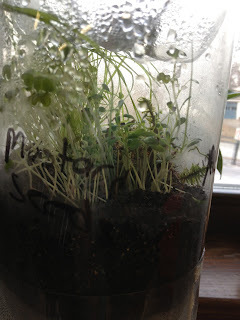 We covered the bottle opening with mesh and filled the top with a cup of gravel and 3 cups of soil. Then we planted and watered our seeds. We had mustard, rye, alfalfa and we added some moss for good measure. The seeds germinated very quickly! I planted the seeds on a Friday and set up the aquariums on a Monday. The aquarium is the bottom part of the ecocolumn. Into that we added a cup of gravel and five cups of water. We added Elodea, duckweed, and algae as our aquatic plants and let them do their work. Next, we added our animals! We have guppies and snails in the aquarium and cricket into the terrarium. This was such a neat project and the students loved it! I will add pictures of their notebooks and labs in my next post! Here is a close-up of our fish and snail. These are the completed columns! I put some in a soda container to keep them from tipping. Here is the Elodea and a snail.